Beach Access Day, Sculpture by the Sea, Cottesloe 2016. Photo K Drennan. Visitors with disability and their carers are invited to participate in a free Tactile Tour of some of the sculpture in the exhibition with experienced DADAA guides. Individuals, school students and groups from disability service organisations are all encouraged to take up this opportunity. Tactile Tours are designed to introduce visitors with disability to new ways of experiencing and enjoying contemporary sculpture through informed discussion and touch. The works selected for each tour have been nominated by both the Artists and the Sculpture by the Sea Site Manager as being safe to touch. The sculptures are located in accessible areas. Verbal descriptions of the sculpture visited during the tours are offered to participants who are blind or vision-impaired. A Tactile Tour lasts approximately one hour. Early evening Tactile Tours are available at 6.00pm on Tuesday 15 and Wednesday 16 March. Meet your Tactile Tour Guide (who will be wearing a dark blue t-shirt and ‘Tactile Tour Guide’ badge) at the ‘Tactile Tours Meeting Point’ sign located next to the accessible entrance on Marine Parade at the wooden table under the trees. BOOKINGS are essential as there are a limited number of places per tour. Your booking is not confirmed until you receive a confirmation email from DADAA. Please email your booking requirements (contact name, mobile number, number of participants, and their requirements, dates and times requested): [email protected] or fax: (08) 9336 4008. Special matting will be installed for two days during exhibition which will enable visitors with limited mobility and those using manual wheelchairs to access sculpture located in specific areas on the beach. The beach access matting will be available from 10am and staffed until 7pm on Wednesday 15 and Thursday 16 March. Please note, the beach access matting is not suitable for power wheelchairs or mobility scooters. Please be aware there is limited parking available for people with Easy Access Parking Permits. Information about the Iluka Beach Access Day and a map will be available soon. A program of free Artist Talks is available each weekend during the exhibition. Visitors are invited to meet international and local exhibiting artists on site by their work and hear them talk about their ideas and creative practice, while sinking back into the comfort of a bean bag! The Artist Talks will be Auslan interpreted on Sunday 5, 12 and 19 March. Starting at 10am there will be six sessions per day, each running for approximately 10-20 minutes. Details about the artists involved, times of their talk and where their sculpture is located will be available on the Sculpture by the Sea, Cottesloe website and at the exhibition Catalogue Marquee and Site Office. 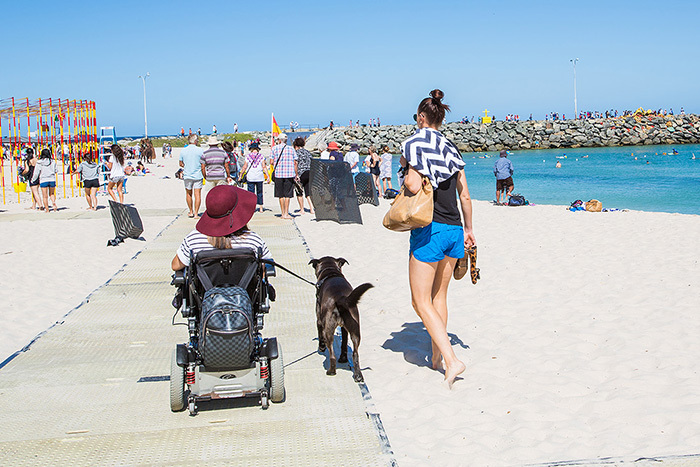 Beach wheel chairs will be available for visitors with disability to use during their visit – available at the exhibition site office. We suggest the chairs are on loan for about an hour. A driving licence or bank card is required as security during that period. For more information or to book a beach wheel chair please call the site office on (02) 8399 2322. Information pages from the Exhibition Catalogue will be provided in an enlarged A4 format for visitors with low vision to refer to during their visit. This will be available at the Catalogue Marquee and it is requested that it be returned for others to use during exhibition.